Last fall I was invited to my cousin’s beautiful outdoor wedding here in Phoenix, Arizona. Mosquitos are rare here because it’s so dry but due to excessive rain, it caused an influx of mosquitos throughout the valley. So here this perfectly planned wedding in October was on the verge of being a mosquito fest instead. Needless to say, things ended up turning out great in the end and the crisis was averted. They ended up having a lot of citronella candles and offered bug spray to all the guests as they entered. My cousin informed me about this issue the day before the wedding. So this prompted me to search for a natural mosquito repellent using essential oils. I then grabbed what I had available and made a small mixture of bug spray. The spray worked perfectly and we were barely bugged at all by the mosquitoes. The best part about using the natural spray was there is no nasty stinky residue stuck on your skin. In fact, I even got a few inquiries and compliments about the bug spray too. The first try with this recipe I used DoTerra Purify essential oil and a little Lemongrass essential oil mixed in witch hazel. The DoTerra Purify blend contains Lemon, Lime, Pine, Citronella, Melaleuca, and Cilantro essential oils. For the second try, I’m going to still use Purify and Lemongrass essential oils but this time I’m going to add Geranium and Lavender essential oils as well. Lemongrass is a must when it comes to mosquito repellent – it goes hand in hand with Citronella oil. You’ll need a bottle of witch hazel. I bought mine from Vitacost.com and it came in a 16 oz. bottle. You’ll find it at your local drug store near the first-aid section. Witch hazel is a natural antiseptic and an astringent. Other oils which could be used are Peppermint and Cedar wood. 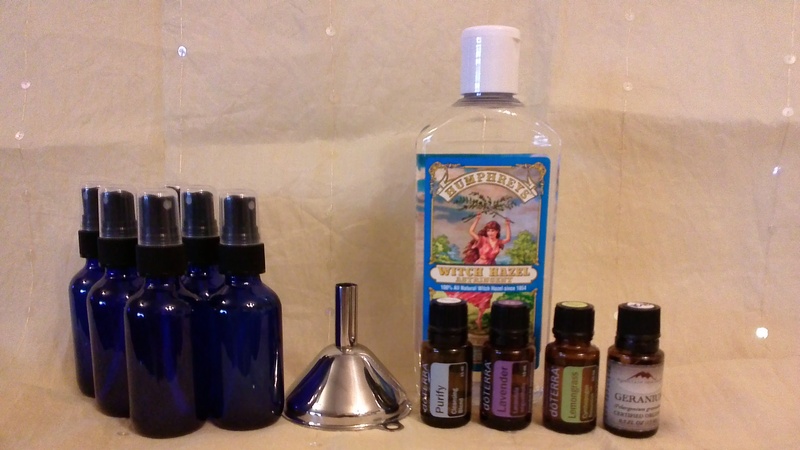 Pour witch hazel into a glass jar then add your essential oils. 10 of Geranium, 10 Lemongrass and 10 Lavender. Put cover on jar and shake vigorously until well mixed. FYI – it’ll be cloudy looking, no worries. Pour mixture into designated spray bottles using a small funnel. Directions for Use: Spray on exposed body areas and then rub it in. Keep clear of the face and eyes. If applying to a smaller child, try a small area first to ensure no reaction to any of the ingredients. You could also spray the area around where you’re sitting outside! There’s great flexibility when it comes to this natural bug repellent and the best part, there’s no need to bathe after use unlike the chemical filled bug sprays. So enjoy this lovely natural scented bug spray the next time you attend an outdoor event. Save yourself time, money, and your health by making this simple bug repellent! $8 total for all oil drops – This varies in terms of costs for particular essential oils per drop, so this is a rough estimate. If you’d like to purchase or find further information about any DoTerra Essential oil products, please visit DoTerra Essential Oils. ← My Saturday Rant…I’m a Total Lactivist!